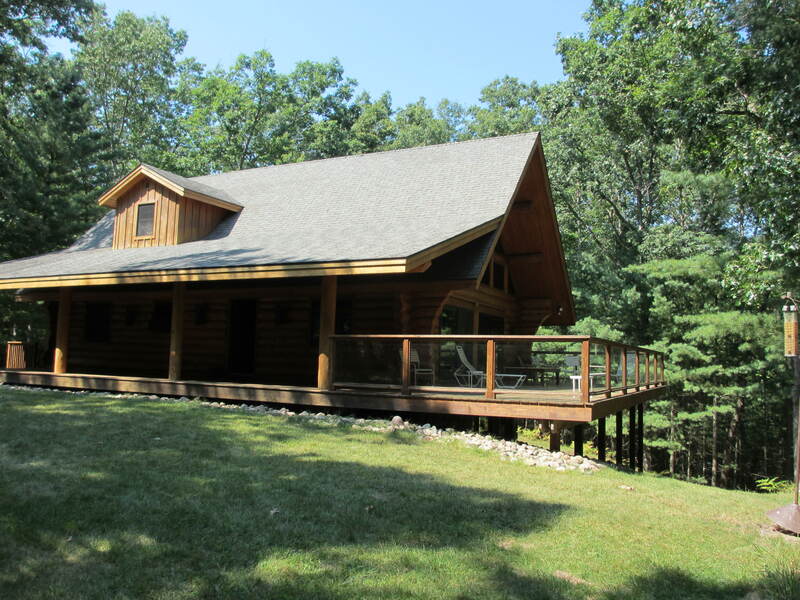 Picture a deck overlooking the Pere Marquette River. Large wooded lots ensuring privacy from neighbors. Deer wandering through the front yard. Miles of hiking trails leading from the driveway. Swimming, fishing, shuffleboard and volleyball minutes from your cabin. Laying in bed listening to the soft sounds of leaves blowing in the wind…and then quiet. All of this was the amazing experience we lived for five days on our recent family vacation to Barothy Lodge in Walhalla, Michigan. It had been many years since my family and I visited Barothy Lodge. We first discovered Barothy about nine years ago when my dad’s friend purchased two nights for my parents to take a break from Dad’s tough cancer treatment regime. My parents added two nights and took the family. We had a blast and returned the following year. During both trips, we stayed at Gray Hawk, a two-story home that sleeps 11. Gray Hawk is the only cottage on the lodge property that has its own private pool (the others share a community pool), which is a definite plus. This beautiful getaway became my dad’s favorite family vacation spot (and our last before his death). 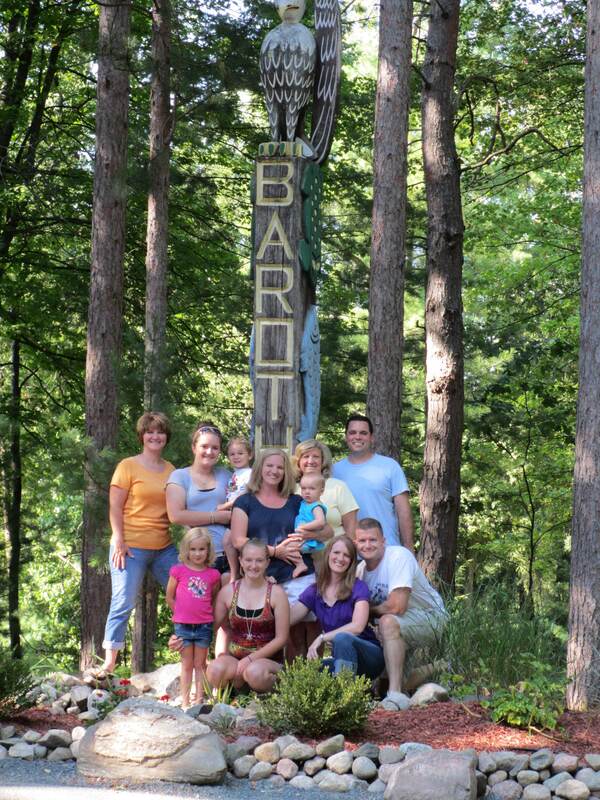 So when my mom suggested we look into Barothy Lodge for our annual getaway this summer I was instantly taken back to memories of laughter, nature, family and fun. I couldn’t wait to share the place with Justin, as well as introduce it to my two young nieces and my nephew who were born since our last trip. Chinook. Pictures don’t do it justice. accommodating two to 21 people. As you pull into the entrance, the driveway is lined with woods on either side. You get the sense that you entering a world away from the chaos of life, and I almost instantly felt tension melt away. And on the second day when Justin and I were exploring the property early the next morning, he reiterated how relaxed he already felt. If only we could bottle the positive qualities of spending time in nature. The staff is very welcoming and accommodating. Pretty much everything is included in your reservation – bedding, towels, full kitchen with dishwasher, washer/dryer (with detergent), grill, portable box fans, and if needed, high chair, roll away bed and crib! We decided that everyone would bring their own breakfast, lunch and snack foods, and each family would cook dinner for everyone one night. This worked out great. Chinook is located at the end of a long, wooded road so it’s secluded and quiet. It’s quite impressive when you round the final curve to enter the wide driveway. 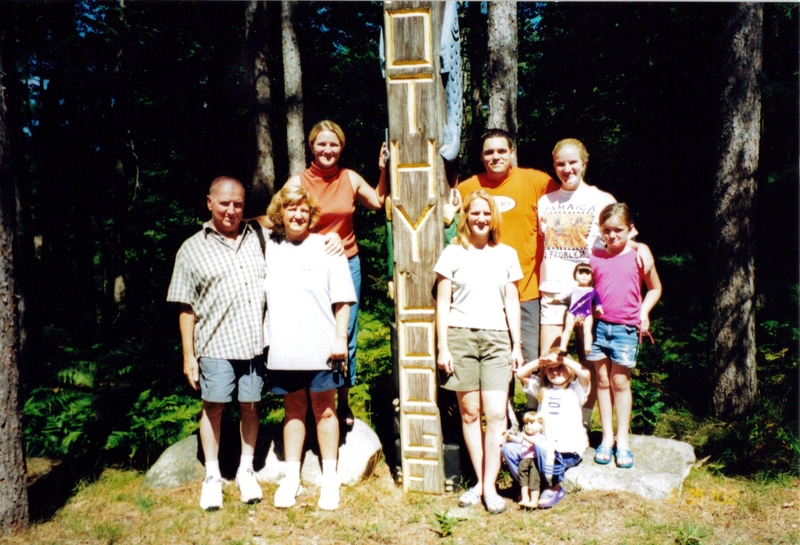 The log home was built in 2000 and was plenty spacious for our large family. Vaulted ceilings provided floor to ceiling windows along the back of the home, overlooking woods and the Pere Marquette River. Justin and I took the upstairs bedroom with full bath and floor to ceiling windows. On the main floor were a spacious living room, dining area, kitchen, bathroom and another large bedroom, which my sister, brother-in-law and their kids claimed. A huge stone fireplace is the centerpiece of the main floor and I can imagine is fabulous in the colder months. The rest of the family slept in the bedrooms on the walkout lower level that also included another full bathroom, pool table, seating area, laundry room and hot tub. We spent a lot of time on the wraparound deck that had plenty of seating and beautiful views of the river and woods. While I had been to Barothy Lodge before, it had been more than eight years and subtle changes had taken place. The grounds were updated, including more trails, a large community fire pit, fountains in the ponds and pens with a variety of birds. There is plenty to keep all ages busy during the day. A community swimming pool, stocked fishing ponds, basketball court, sand volleyball court, shuffleboard, swing set, playground and animal petting pens were a short walk from the cabin. We hiked and biked on the miles of trails winding through Barothy’s property and into the surrounding Manistee National Forest. If we wanted to hang out at the cabin, a hot tub and pool table beckon. Or the relaxing lounge chairs on the large deck offer a perfect spot for reading, chatting, or napping. I quickly learned that if my fiancé went missing, he was most likely laying on the bed in our room, feeling the breeze from the huge windows that overlooked the woods. True relaxation. Phrase and Phase 10. We eventually ventured into Ludington to walk the beach and have dinner, but otherwise we were content enjoying the solitude of Barothy. I should disclose that there are no televisions and Wi-fi is sketchy. But honestly, I never missed television and never had an interest in checking email. We had books and magazines, or one of the many activities available or even the kids to entertain us. Or the glorious option of just sitting and listening to the birds chirp, leaves rustle on the trees, and the river flow by. It was easy to be immersed in family and nature. Just the way a vacation should be! We all agreed that this one of the best family vacation spots and we certainly plan to visit again soon.